C-Line's 5-Tab Binder Pockets keep information accessible by labeling all of your document storage items. Group letter-size sheets into the Binder Pockets and use the write-on index tab to make it easy to identify where information is. Colorful poly pockets organize your binder with style and efficiency. Full size pocket with flap holds additional materials. Write-on index tabs allow you to instantly categorize your binder. Works with pencil, ball point pen or permanent marker. For use with standard 3-ring binders. Archival quality protection. For 8-1/2 x 11 inch document storage. Side loading. Assorted colors include amber orange, lime green, charcoal gray, raspberry red, steel blue. 5 pockets per set. With over 60 years of experience, C-Line's many product offerings include sheet protectors, name badges and holders, shop ticket holders, media storage products, laminating film, report covers and project folders, photo holders, Memory Book page protectors, office accessories, transparency film and more. Brand: C-Line | Manufacturer: C-Line Products Inc.
Warranty: Manufacturer's warranty will fully replace item of equal value if defective in materials, manufacturing or packaging at the time of purchase. Except for such replacement, this product is sold without warranty or liability even though defect, damage or loss is caused by negligence or other fault. 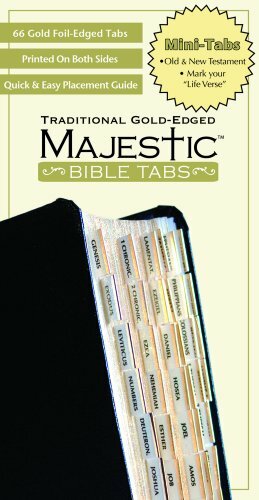 Majestic Traditional Gold-Edged Bible Tabs set, mini 72 gold foil-edged tabs for Bibles from 4 inches up to 8 inches. Set includes tabs for Old and New Testaments. Also includes a selection of special tabs for marking your concordance, note sections and even your own special Life Verse. Tabs are printed on both sides and come with a quick and easy placement guide. Easy-to-follow instructions and Tab Positioning Guide included in each package. Pre-cut tabs are 1 long and fold to extension from page. In 1955, Walter Cunningham, the founder, envisioned a company dedicated to meeting the filing, indexing and labeling supply needs of the industry. That firm, Superior Tabbies, Inc., evolved into today's Xertrex International Inc.
As a paper converter, Xertrex, and its and BARCO LABELS Divisions, manufacture and distribute products throughout the United States, Canada and Europe. Headquartered in Itasca, Illinois, a suburb of Chicago, the firm maintains a manufacturing plant that utilizes 42,000 square feet of production capacity. Tabbies is a major manufacturer of quality filing, indexing and labeling products, including color coded filing supplies, indexes, media storage items, laser labels, index tabs, custom index dividers, custom labels, and other ""simple solutions@work."" has been a pioneer in the development and manufacturing of self-adhesive filing, indexing and labeling products. Through innovation, products have been developed to make filing and indexing tasks easier than ever before. Many of our items are unique in their approach and will save you time and money. Now in its third generation, the Cunningham family continues to take an active role to ensure that customer requirements are well served and that the company's reputation as progressive, innovative and growth-oriented is maintained. We use the highest quality papers, inks and adhesives. Almost all of our packaging and products are made from recycled/recyclable paper. The use of soybean oil in our printing process makes us considerate of the environment. Over the years, administrative assistants, lawyers, medical administrators, record keepers and many other professionals have continued to use supplies for cost savings in the office environment, as well as increasing efficiency in filing and organizational procedures. Post-it Tabs are extra thick and strong to stand up to long-term wear and tear. Great for labeling file folders. 5 colors, 30 tabs total. Post-it Tabs are extra thick and strong to stand up to long-term wear and tear. Great for dividing notes, expanding files and project files. 4 colors, 24 tabs total. Modern office: document classification, catalog classification, key information reminder, work memo, leadership instructions. School teachers and students: page labels, reading notes, lecture tips, job review, document classification. Family information transmission: daily work content, social activities, life information, etc. between family members. 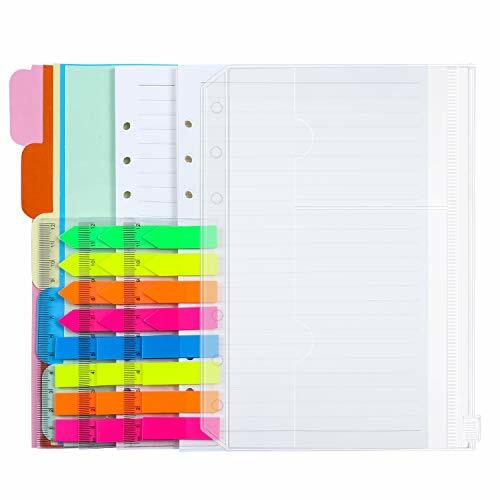 Writable and repositionable: half of the file folder tabs strips with self adhesive and half can be written, repositionable, stick securely and remove cleanly. Rich quantity: 400 pieces index tabs are enough to use for a long time. 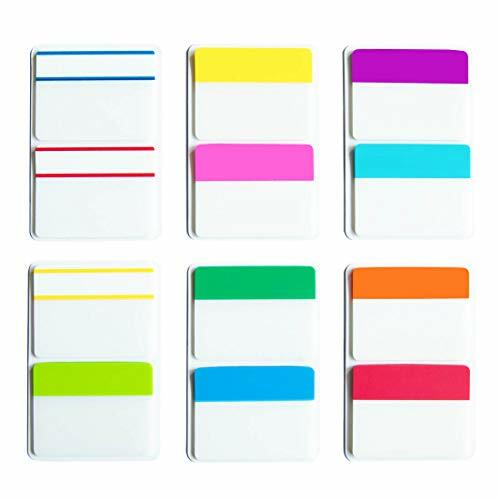 Multicolor: 10 different neon colors, organize categories by color flexibly. Characteristic: waterproof, not torn, smooth writing; Self adhesive part is transparent, non-toxic and tasteless. 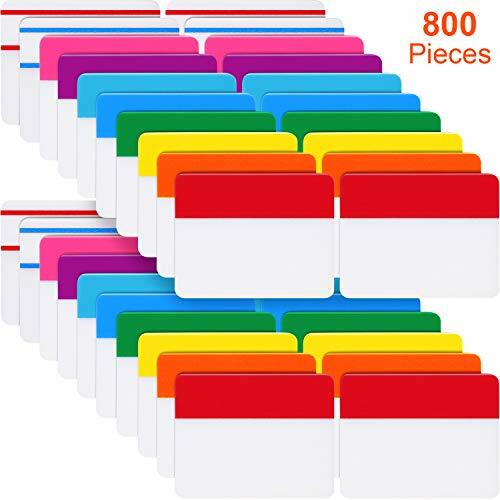 Rich quantity: 800 pieces index tabs are enough to use for a long time. 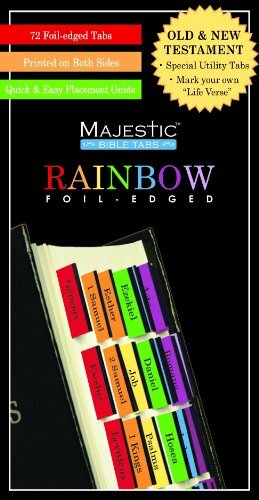 Majestic Rainbow Bible Tabs Perfect for those who carry their Bible with a sense of style. The festive rainbow tabs are a visually pleasing way to find favorite Scriptures. 72 green foil-edged tabs for Bible from 7 inches up to 12 inches. Set includes: Old and New Testament tabs, special notation tabs and a Life Verse tab. Tabs are printed on both sides, come with a quick & easy placement guide and are placed in a compact 3.25" x 6.25" package that can either hang on a hook or stand on a counter. 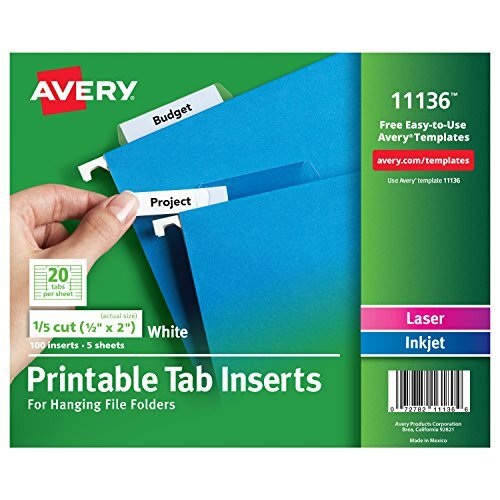 Label your hanging file folders with these 1/5-cut WorkSaver Tab Inserts. The white background makes text jump out, resulting in clearly readable labels for your files. Customize the included inserts using your computer, laser or inkjet printer and a free template on avery website. The tabs are also designed for use with a typewriter. The side-by-side design allows for printing on both sides. Finding the right hanging file folder will be so easy, it'll make your filing cabinet seem like an oasis of organization. 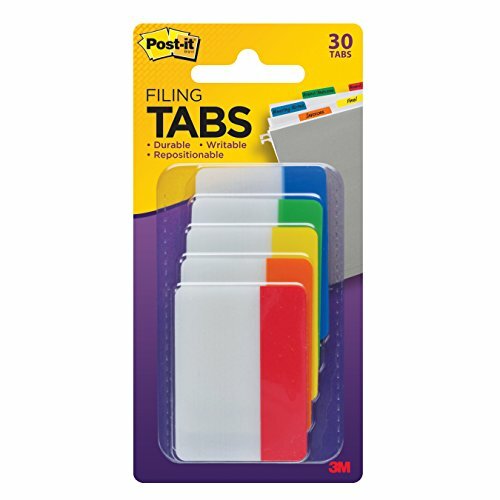 Made of durable plastic, these colorful adhesive tabs make organizing your notebooks and loose papers a breeze. Mini Ultra tabs are durable, repositionable tabs that make indexing, flagging and referencing documents quick and easy. The tabs are writable on both sides and the adhesive bodies are clear so you can see text underneath. You can write on the tabs and bodies with most pens, pencils, markers and highlighters, and they're smudge free. * the multiuse tabs are ultra-versatile and great for organizing everything from documents, files, notebooks and more. They're also ultra-removable and stick securely but remove easily. Perfect for home, office and school. *Ink dry times may vary. Tab may lift some inks. Test before applying. *Ink dry times may vary. Tab may lift some inks. Test before applying. 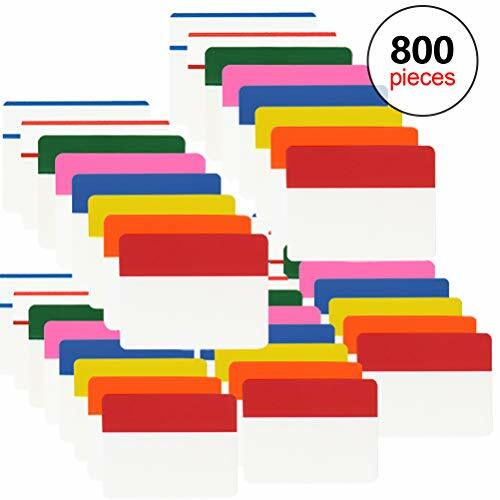 Tabbies is a major manufacturer of quality filing, indexing and labeling products, including color coded filing supplies, indexes, media storage items, laser labels, index tabs, custom index dividers, custom labels, and other "simple solutions@work." has been a pioneer in the development and manufacturing of self-adhesive filing, indexing and labeling products. Through innovation, products have been developed to make filing and indexing tasks easier than ever before. Many of our items are unique in their approach and will save you time and money. Tabs are printed on both sides for easy reading and quick reference and Pre-cut 1 long and fold to extension from page. 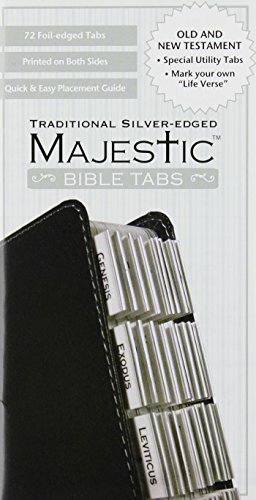 Bible Indexing Tabs - The best selling tab for THE best seller! 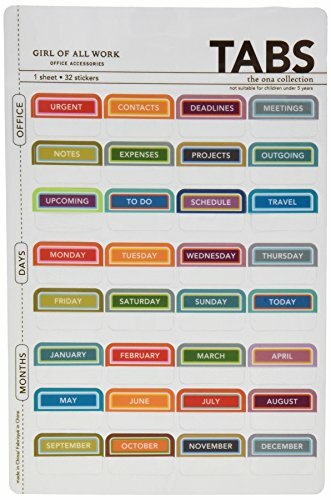 Tab any size bible with these pre-cut, self-adhesive tabs. Permanent adhesive; won t fall off. Tabs are printed on both sides for easy reading and quick reference. 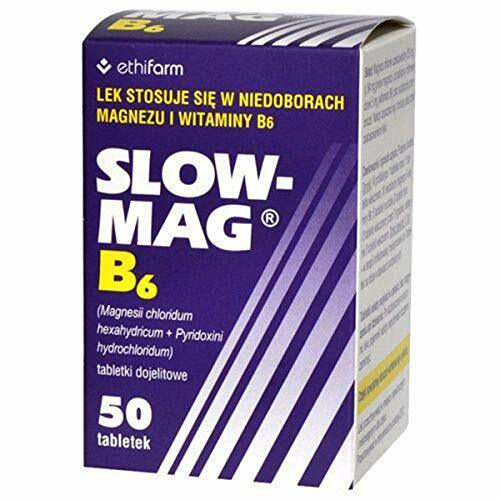 Easy-to-follow instructions and Tab Positioning Guide included in each package. We offer over 20 varieties to choose from. 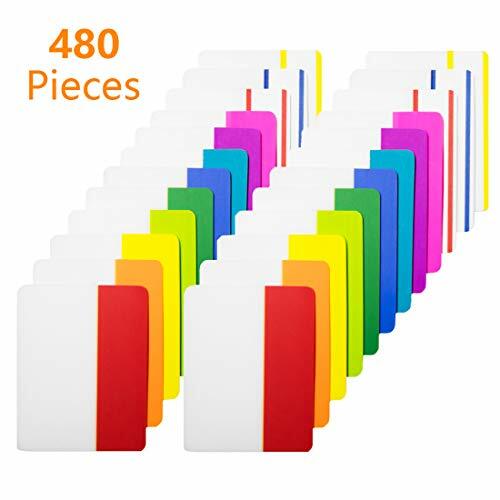 KIMCOME is a professional supplier of sticky index tabs. We promise our warranty policy will be applied to all your items after your purchase. 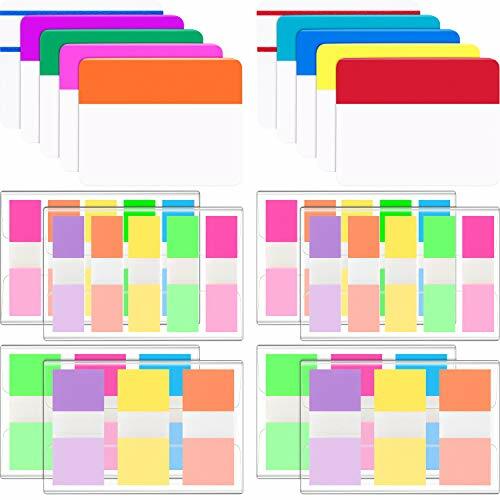 KIMCOME Tabs give you a simple way to get files organized, labeled and color-coded in one easy package. Secure, self-stick tabs offer quick and easy tabbing and indexing. Easy to write on and simple to remove, replace or reposition. Use them to label file folders, expanding files and project files. Ensure your perfect filing system lasts by adding labels with KIMCOME Durable Tabs. 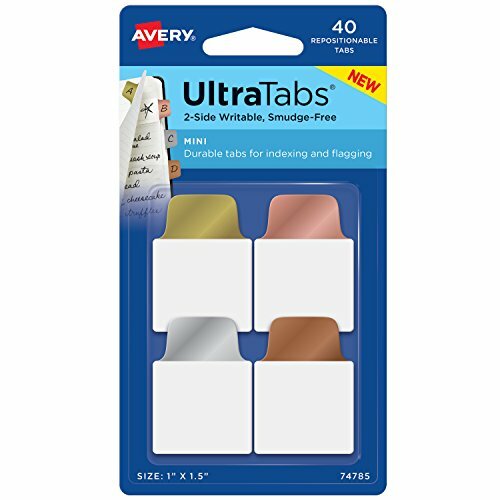 Unique adhesives make our tabs can be used over a hundred times, Stick Securely and Remove Cleanly. 1. Please kindly use ballpoint pen and straight-type ballpoint pen. 2. Please kindly keep the index tabs away from heating devices and fire. 1. Every KIMCOME product includes a 60-day money-back and 24-month worry-free guarantee! Your Satisfaction is our Top Priority - Please contact us at any time if you have any questions. We will reply to you asap or refund you in full. 100% SATISFACTION GUARANTEED: Please contact us at any time if you have any questions. We will reply to you asap or refund you in full. Cardinal One-step Table of Contents Dividers help you create an index system instantly. Keep your annual to-dos in order! 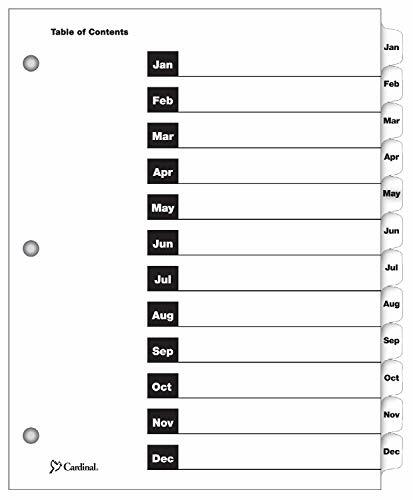 This monthly set includes a white TOC page and matching January through December tabs. Orient your binder vertically or horizontally for spreadsheets. Just flip the tabs to discover months written for portrait or landscape view. Tabs and rings are reinforced with Mylar material to hold up to heavy use without tearing. Free online templates help you create new TOCs, covers and spines see details on package. 8. 5" x 11". White. Mylar is a registered trademark of DuPont. Brand: TOPS Business Forms, Inc. | Manufacturer: TOPS Business Forms, Inc. Product Warranty Please contact us at any time if you have any questions. We will reply to you asap or refund you in full. Rich quantity: 840 pieces index tabs are enough to use for a long time. 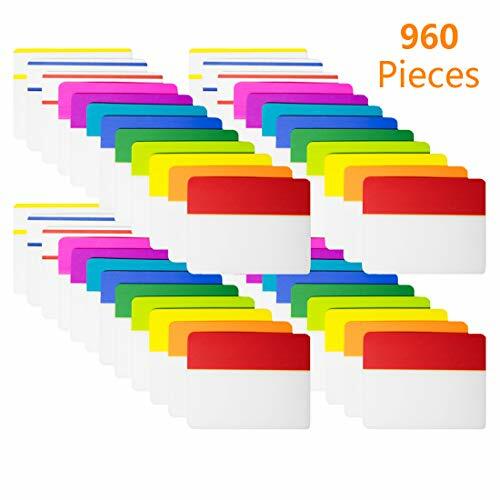 Multicolor: 10 different neon colors, organize categories by color flexibly; 2 smaller sizes only 6 different neon colors. For nearly 20 years, Ultimate has sold millions of MagniFile and PolyMagniFile Hanging Files to thousands of satisfied customers, all who have experienced the enormous time-saving benefits of MagniFile's full-length, magnified lenses. Using our new MagniFile Hanging File Indexes, now you can convert your existing hanging files into MagniFiles and experience those same benefits. The patented, 3-prong design installs quickly and securely into the slots of your existing "standard" files. The domed lenses double the print size of your file labels, and the full-length profile allows for longer, more descriptive titles. This makes retrieving and returning your files faster and easier than with traditional files. Sold in sets of 10, indexes come complete with gray-tipped indexing labels. Optional color-coded labels also available. Available in Black or Assorted tops. CHOOSE YOUR COLOR - Available in your choice of assorted or black tops. Product Details: Eye-catching: Multiple neon color index tabs, bright and eye-catching, they can used as instruction, footnotes, page mark, reading labels and so on; Premium material: Index tabs are made of premium PET material, no odor, harmless and writable; Fluorescent colors: Red, Orange, Yellow, Green, Blue, Dark purple, Light purple; Dimension: 2. 2 x 4. 9 (5. 5cm*12. 5cm) Package includes: 2 sets flat colored index flags tabs (280pcs), 2 sets arrow colored index flags tabs (280pcs); 560 pieces in total. 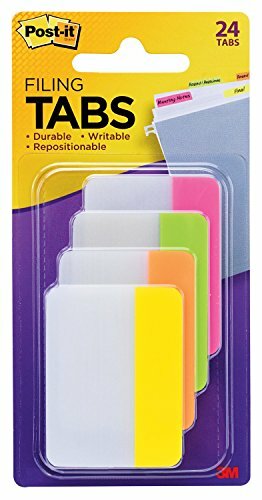 Warming Tips: Fluorescent sticky note can't absorb as quickly as paper, and please do not touch them when you finish writing, otherwise the handwriting will blur. 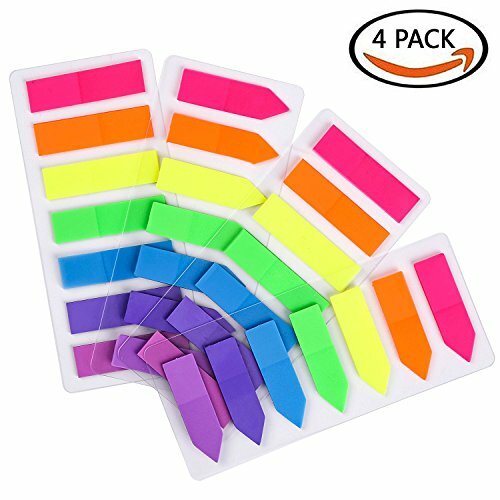 Different Type : 2 sets flat sticky notes, 2 sets arrow sticky notes. 7 Colors/Set, 20 Pages/Color, 140 Pages/Set, 560 pieces in total. Translucent and Writable : The highlight strips won't cover any information you have marked, convenient for searching and reading, perfect to mark documents for a quick and easy reference. 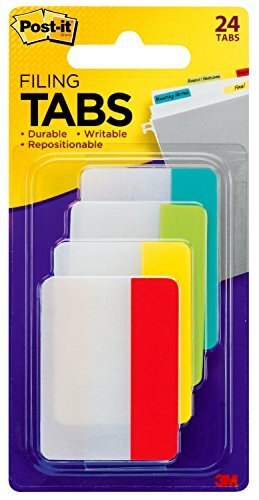 Removable Adhesive : Vibrant page marker tabs index stickers with a strip of solid adhesive backing for sticking to surfaces, easy to remove without hurting papers or pages. Fluorescent Colors : 7 eye-catching colors (red, orange, yellow, green, blue, dark purple, light purple) neon page markers allows you to color-coordinate notes, schedules, file documents, easy to highlight important information. 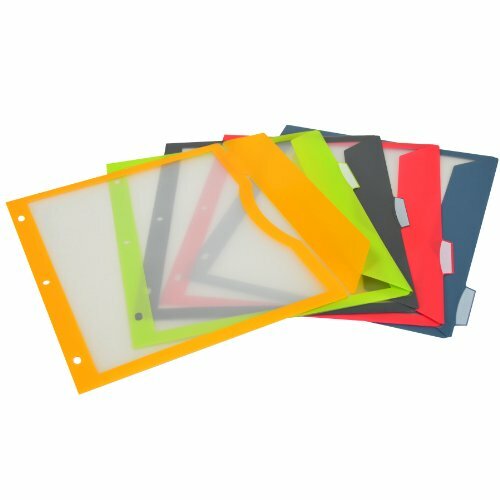 Extensive Use : Eye-catching tabs flags are suitable for book-marking, reading tags& markings, indexing documents, organizing exams, measurements, charting, notebooks etc. 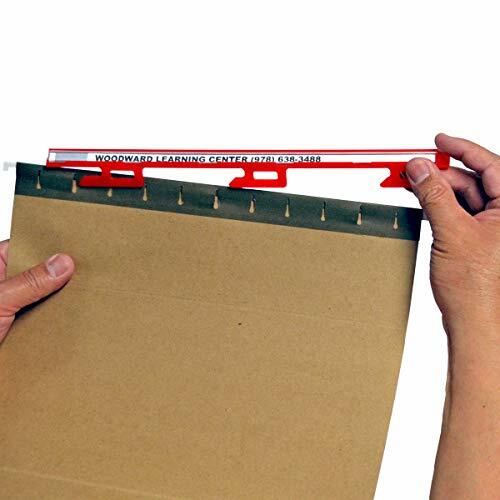 Part of each piece index tab is self-adhesive, easy and convenient to peel off, stick and mark, and can remove if you want to change the mark position, practical to use in daily life. 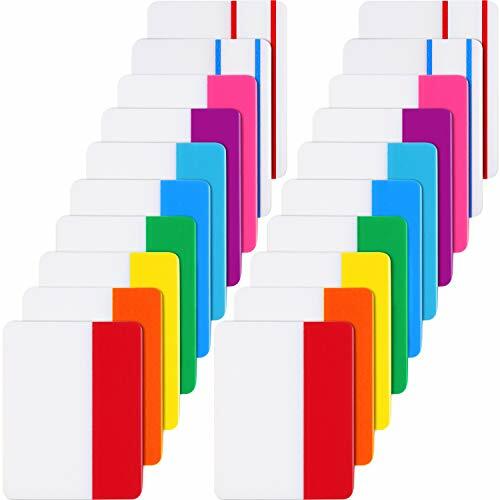 The tabs are available in 8 different bright colors, including red, orange, blue, green, pink, yellow, red line and blue line, various colors for meeting different requirements. Made of quality BOPP material, non-toxic, odorless and not easy to tear, you can use them for a long time. Suitable for marking books, notebooks, magazines, diaries or sticking on file folders and any other marking needs. Great items for students, teachers, doctors and most people. Please allow there are slight color differences in the pictures. Detailed color information is shown as pictures.